BlogHer ’14: What Lens are You Looking Through? I’m so excited that I don’t have to travel this year for BlogHer. As a native San Jose gal, I’m proud that our city is hosting the 10th anniversary of BlogHer. It’s been fun to answer people’s questions about where to eat [San Pedro Square Market] or what to go see [The Tech Museum of Innovation]. I’m also happy to take any fellow ice hockey players to Sharks Ice, which hosts the largest adult league west of the Mississippi, for a quick skate. I have mixed emotions about BlogHer this year. I had been hoping that the startup that I work for would be having a space and providing some really cool activities for fellow attendees. As anybody in the Valley knows, product development doesn’t always go as planned and, alas, a month ago I found myself with some extra time on my hands. So, instead, I am going as myself and with a blog that isn’t as evolved as I’d like it to be. I’ll be looking and experiencing BlogHer ’14 through a marketer’s lens. What brands created the most buzz through their sponsorships, activities or swag. I attended BlogHer ’10 as a vendor. It was an invaluable investment of time that prompted the creation of a new line of headphones for women. It wasn’t about just changing the color. Everyone kept coming up to us and asking if we had smaller sized headphones. Women’s ears are smaller and the standard size just doesn’t stay in. And, when you hear it over and over for a couple of days, you listen. 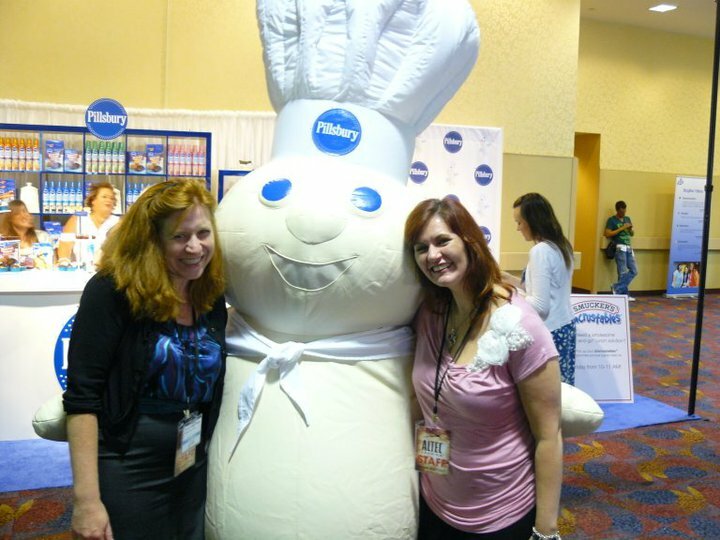 Angel and I sharing a delicious moment with the Pillsbury doughboy at BlogHer ’10. I’m excited to be on the attendee side this year and be contributing thoughts. I’m one of the lucky that have received an invitation for the Merck for Mothers event. I bet they don’t even know how near and dear the subject is to me. As someone who has experienced preeclampsia in two pregnancies and had several friends with postpartum bleeding episodes [it’s more common than you think], I’m all for trying to educate as well as find answers. During the show I’d love to hear about your experiences with the brands. Feel free to comment here, come find me [I’m in the BlogHer app] or tweet me @mktgmixologist. I love this! I attended BlogHer ’10 as a marketer as well (I was there on behalf of Yahoo!/Yahoo! Shine), and found it to be outrageously informative. I think the landscape has evolved so much that it will be fun to think of it through marketing eyes again, though I’m mostly approaching it with a writer’s eyes (since my forward-looking goals are writing focused). I think I did a Shine video. I can’t remember what the focus was, but I’m sure I was talking about infertility. Look forward to meeting you this weekend!